Incoming Inspection => Screen Solder Paste Printing(Dispense surface mount adhesives) => Surface Mounting => Drying(Solidifying) => Reflow Soldering => Clean out => VI&AOI => Rework/Repair. A. Incoming Inspection => Screen Solder Paste Printing on PCB A side (Dispense surface mount adhesives) => Screen Solder Paste Printing on PCB B side (Dispense surface mount adhesives) => Surface Mounting => Drying(Solidifying) => Reflow Soldering(Better on B side) => Clean out => VI&AOI => Rework/Repair. B. Incoming Inspection => Screen Solder Paste Printing on PCB A side (Dispense surface mount adhesives) =>Surface Mounting => Drying (Solidifying) => Reflow Soldering on A side => Clean out => Plate Turnover => Dispense surface mount adhesives on PCB B side => Surface Mounting => Solidifying => Wave Soldering on B side => Clean out => VI&AOI => Rework/Repair. This process is suitable for reflow soldering on the A side of the PCB and Wave Soldering on the B side. Only the pins less than the SOT or SOIC (28) in the SMD of PCB B side , then can use this process. Incoming Inspection => Screen Solder Paste Printing on PCB A side (Dispense surface mount adhesives) => Surface Mounting => Drying(Solidifying) => Reflow Soldering => Clean out => DIP => Wave Soldering => Clean out => VI&AOI => Rework/Repair. A. Incoming Inspection =>Dispense surface mount adhesives on PCB B side => Surface Mounting => Solidifying => Plate Turnover => DIP on PCB A side => Wave Soldering => Clean out => VI&AOI => Rework/Repair. First SMT, then DIP, suitable for SMD components more than separating components. B. Incoming Inspection=> DIP on PCB A side(Bending Pin) => Plate Turnover => Dispense surface mount adhesives on PCB B side => Surface Mounting => Solidifying => Plate Turnover => Wave Soldering => Clean out => VI&AOI => Rework/Repair. First DIP, then SMT, suitable for separating components more than SMD components . C. Incoming Inspection=> Screen Solder Paste Printing on PCB A side => Surface Mounting => Drying => Reflow Soldering => DIP (Bending Pins) => Plate Turnover => Dispense surface mount adhesives on PCB B side => Surface Mounting => Solidifying => Plate Turnover => Wave Soldering => Clean out => VI&AOI => Rework/Repair A side mixed, B side mounted. D. Incoming Inspection=> Screen Solder Paste Printing on PCB B side => Surface Mounting => Solidifying => Plate Turnover => Screen Solder Paste Printing on PCB A side => Surface Mounting => Reflow Soldering on PCB A side => DIP => Wave Soldering on B side => Clean out => VI&AOI => Rework/Repair A side mixed, B side mounted. First SMD on two side, Reflow Soldering, then DIP, Wave Soldering. E. Incoming Inspection=> Screen Solder Paste Printing on PCB B side(Dispense surface mount adhesives) => Surface Mounting => Drying(Solidifying) => Reflow Soldering => Plate Turnover => Screen Solder Paste Printing on PCB A side => Surface Mounting => Drying => Reflow Soldering1(It could be Partial welding) => DIP => Wave Soldering 2(If there are few components, you can use manual welding) => Clean out => VI&AOI => Rework/Repair A side mounted, B side mixed. A. Incoming Inspection=> Screen Solder Paste Printing on PCB A side(Dispense surface mount adhesives => Surface Mounting => Drying(Solidifying) => Reflow Soldering on A side => Clean out => Plate Turnover => Screen Solder Paste Printing on PCB B side(Dispense surface mount adhesives) => Surface Mounting => Drying => Reflow Soldering(Better on B side) => Clean out => VI&AOI => Rework/Repair. This process is suitable for mounting large SMDs on both sides of the PCB such as PLCC. B. Incoming Inspection=> Screen Solder Paste Printing on PCB A side(Dispense surface mount adhesives => Surface Mounting => Drying(Solidifying) => Reflow Soldering on A side => Clean out => Plate Turnover => Screen Solder Paste Printing on PCB B side(Dispense surface mount adhesives) => Surface Mounting => Solidifying => Wave Soldering on B side => Clean out => VI&AOI => Rework/Repair. 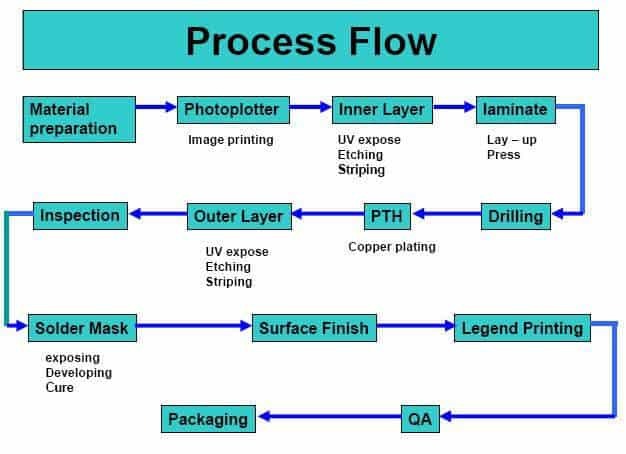 This process is suitable for reflow on the A side of the PCB.